Pepco was called out for spending more lobbying than on taxes after a profit in 2010 of $624 million dollars. PEPCO topped one study’s chart for paying the highest negative tax rate at 57% (taxes – subsidies) of any corporation in the DC area ladt year. Just their CEO was paid $6M in compensation, now PEPCO wants a $42M rate hike? OneDC is furious with this, and last time they went to PEPCO they stormed tthe building and ultimately managed to force PEPCO to make a payment plan and cancel a shutoff notice for one resident threatened with having their power shut off. This time around, PEPCO locked their doors and forced everyone who had showed up to pay their bill to line up outside to be admitted one at a time. At their main door, a security guard was posted to check employee ID’s at one door while all other panels were locked. 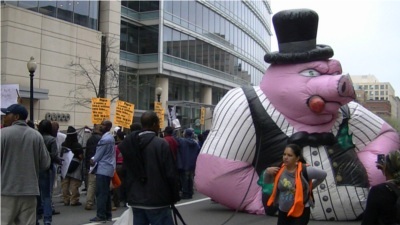 More people receiving huge bills from PEPCO spoke out on March 21 in front of PEPCO. One person was billed $700 for electricity they hadn’t used. Another was facing a cutoff with a refrigerator full on insulin for diabetes. PEPCO’s suggesting to them was recounted as being “get an icebox,” the same solution they seem to advocate for power outages caused by storms. The march originally took 9th st in front of PEPCO, but the cops decided they needed 9th st for traffic to pass, asking the protesters to move the the sidewalk blocking PEPCO instead. OurDC happily complied with that, sealing PEPCO’s doors with a simicircle of protesters. Speakers demanded to be let in, or failing that, that PEPCO at least let in the folks who had shown up to pay their bills. Many of the people in line, for their part, made it quite clear that they supported the protest.